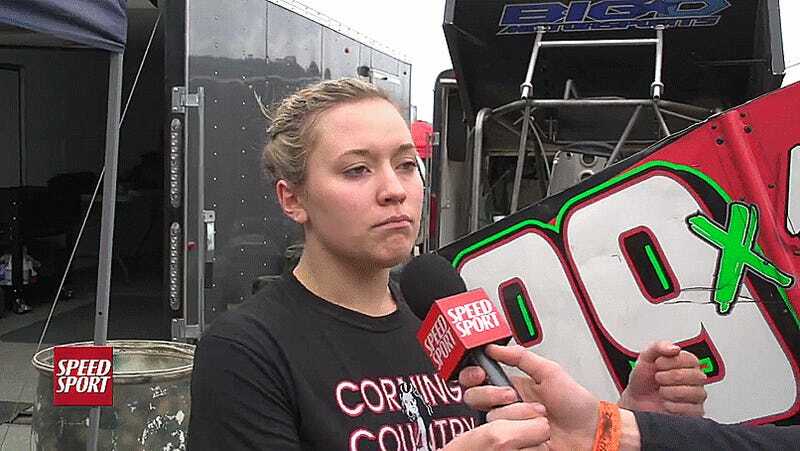 Sprint Car racer Brenna Johnson gave perhaps the best angry interview of all time after getting torpedoed out of a race. Her post-race interview with Speed Sport is proof that racers should use fewer words and more sound effects, for sure. While I can appreciate the honesty of a frustrated racer willing to politely call out the racer who hit her on camera (and the fact that she didn’t say “hell” when asking him about the incident), it’s the crash reenactment that really takes the cake here. If every racer acted out the reason why they’ve been taken out of the race, post-race interviews would be must-watch entertainment. Alternately, just let “BRAAAAAAAAAAAAPPFFFFEEWW” be the new default answer to everything because this is just great.